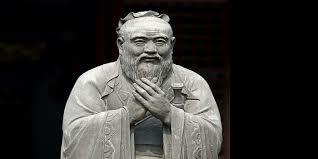 Although Western people have heard many jokes about Confucius, very few understand his main ideas and how important his thinking has been to Chinese culture and society. If we are serious about understanding China it is imperative that we acquaint ourselves with this ancient sage. China’s cultural environment is radically different from Western cultural environments. Although China can boast of the longest continuous civilisation on earth (4000-5000 years), it has never experimented with a democratic form of government such as that which was introduced in Athens, Greece around 2,500 years ago. 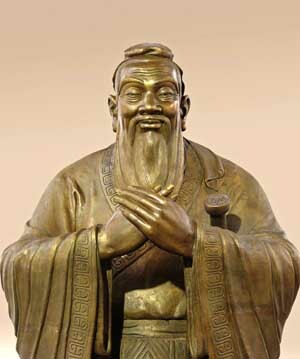 At that time, Confucius was developing his ideas about culture, government and society in China. These ideas took China in a different direction, and helped lay the foundations of an enduring culture which forms the backbone of Chinese society today. Confucius lived during a period of widespread social chaos. This influenced his thinking and led to his observation that a stable system of government was more important than the rights of any individual. He believed that a structured hierarchical society with clearly defined roles, responsibilities, and behaviours would promote social harmony. The family would be the most important unit in society, education would be highly valued, and a good ruler who governed wisely and fairly would enjoy the political security of the ‘Mandate of Heaven’. Thus there would be no need for harsh punitive laws. Unfortunately, the first emperor of a united China, Qin Shi Huang Di, was not a benevolent ruler in the Confucian tradition. He was a tyrant who established the Qin Dynasty in 221 BC after defeating the other competing (Warring) states: a ruthless leader who used Confucious’ model of an hierarchical society to bolster his authority and centralise his power. Much like the Party does today. But he was good for nation building. He replaced previous inefficient administrations with a centralized bureaucracy and introduced many changes. For example; he standardized the written script, established a uniform system of weights and measures, and connected cities and provinces with a network of roads. He collected taxes, drafted soldiers, and obligated citizens to construct a defensive Great Wall. He also persecuted independent-minded scholars and burned their books. In recent times, the Party has behaved similarly. Although it has reunited China and used its centralised power to guide the development of the nation, it also controls information and punishes independent thinkers. Not long after Emperor Qin’s death, his dynasty collapsed. It had lost the ‘Mandate of Heaven’ and the people revolted against its cruelties. But the structure of his government remained intact, and has survived until the present day with few modifications. Benevolent leadership would come later with other dynasties and emperors. For example, the Han dynasty which replaced the Qin dynasty relieved the burdens imposed on the peasant populace and earned an honoured place in China’s history for doing so. Later, the Tang and Song dynasties would produce emperors whose enlightened leadership would allow Chinese culture to flourish. In those times, the capitals of these dynasties – Chang’an and Suzhou – were the largest and most civilised cities in the world. The point is: Confucian cultural values have proved to be so deep rooted that invaders of China such as the nomadic Mongols from the north and the agrarian Manchus from the northeast both failed to impose their cultural values on their acquired Chinese empire. In fact, the reverse happened. Ultimately these militarily powerful conquerors were absorbed into a resilient Chinese society. One might ask: who in fact conquered whom? Even Chairman Mao’s attempts to ‘conquer’ Confucianism by replacing it with a foreign ideology failed. Today we see the Party leadership promoting an harmonious society via the virtues of Confucianism rather than the dogmas of Marxism/Leninism. This is not unusual. Throughout China’s long and turbulent history, usurpers of power have always sought to legitimise their rule by this means. For example; many emperors extolled Confucius’ statements prescribing submission to authority, and ignored his precepts on social justice, political dissent, and the moral duty of intellectuals to criticise the ruler if he abused his power and oppressed the people. Nevertheless, Confucianism has outlived every other ‘ism’. In fact, whenever Chinese people rose up in revolt against a cruel or ineffectual emperor, they never once considered changing the system as well as its leader. The system was culture. It was not until the early 20th century that the imperial system was overthrown. However, the promise of revolutionary cultural change has not been realised. Sun Yat Sen’s republican ideals, and the Party’s communist ideology have both failed to alter or supplant traditional Confucian values. These foreign ideological invaders have been absorbed into a tenacious Confucian culture. This is what happens when foreign individuals, ideologies, and enterprises misunderstand or disrespect China.